Join us to review the past year, and ring in the new one. We will vote for new Officers and Board Members, and review the budget for the coming year. Can't get much more exciting than that! The prison paws program was started in 2004. It is a canine training program which allows inmates an opportunity to learn new skills and improve self-esteem while socializing canines, and teaching them basic manners so the canines are better community members. Jen started with Prison Paws in December of 2015. She has been training dogs professionally since 2003 and has been a Certified Professional Dog Trainer (CPDT) since 2009. She has worked primarily in animal rescue settings, such as shelters and at a large animal sanctuary. In these settings, she has worked with a variety of at-risk groups, including teen mothers, middle school kids with emotional and behavioral disabilities, and teens in chemical dependency recovery. "Working with dogs and people is my passion and I love learning from all of them!" The mission of Young Families Early Head Start, Inc. is to assist and support low-income, primarily teen, parents and prenatal parents in pursuit of their educational goals and the development of their parenting skills, while providing comprehensive quality child care for their infants and toddlers, birth to age three. THE GRAND ESCAPE ROOM is a real-life escape game created for small groups of people. Your common goal is to escape from the locked room in under 60 minutes by finding hidden objects, solving riddles, unraveling clues and working together as a team to plan your escape. This is great fun and loads of laughter, with just a little chaos thrown in to keep it interesting! Evelyn grew up in the Gallatin Valley, on a farm. She started the Big Sky Business Journal 34 years ago, publishing twice a month, focusing on a broad range of news of interest to business people. It was the first business publication in Montana. She also produces the Monday Morning "Hot Sheet" sent out via email to thousands weekly. The business is a partnership with her husband, Dennis. "How Public Health Affects You" - Come hear this fun yet important message from the Director of Environmental Health Services at RiverStone Health. Montana Beef Council was created in 1954 by cattlemen as a marketing organization for beef. MBC is organized to protect and increase demand for beef and beef products through state, national and international beef promotion, research and education, thereby enhancing profit opportunities for Montana beef producers. National legislation in 1985 made the "beef checkoff" into a nation-wide self-help program for cattle ranchers and includes the iconic, "Beef. It's What's For Dinner." campaign. Chaley Harney joined the Montana Beef Council in 2012 where she serves as the executive director and administers the program in Montana with a staff and board of directors. National Volunteer Week is April 23-28. Come learn about why volunteering in your community is so important. It can help cultivate hope and inspiration both in daily life and during a crisis or disaster. Volunteering enables us the opportunity to help improve the lives of others as well as yourself. Scientific studies have shown that individuals who volunteer enjoy psychological and physical benefits. Come learn about how you can help make this world a better place! Melanie will discuss the BillingsWorks 2017 workforce survey results regarding employer perceptions of challenges in this region around workforce. 5:30PM - Gainan's - 810 Bench Blvd. Following the tour we will meet at the Stadium Club (1029 Main St.) for networking with food and beverages available. We will have tables reserved on the patio if weather permits. You are encouraged to bring guests! Come to one or both parts of the event. Youth Mental Health First Aid is a training program designed to teach parents, family members, caregivers, teachers, school staff, peers, neighbors, health ans human services workers, and other caring citizens how to help an adolescent (age 12-18) who is experiencing a mental health or addiction challenge, or is in a crisis. Lunch and Learn at the Billings Public Library. Come meet with Director Gavin Woltjer and Foundation Development Director Leslie Modrow and learn more about the library and how you can use it. $5 per person. Please bring whatever you would like to drink and a side dish or dessert to share, MAFE will provide fried chicken, pulled pork sandwiches, water, and lemonade. Guests and families are welcome! Please RSVP to Mafe.rsvp@gmail.com by Friday, June 23. Come listen to story teller Kevin Kooistra, of the Western Heritage Center, as he guides us on a walking tour of downtown Billings and answers questions about how "The Railroad Shapes Our Town". Why is the railroad in the center of Billings? Why were we built away from the River? Why Division Street? This tour should be both entertaining and enlightening! Please note: Tour will leave the Western Heritage Center promptly at noon. Come join the conversation! Let's talk about what MAFE looks like in the near future. What do you like about MAFE? What would you like to see us do differently? What do we have to do to remain as a relevant organization moving forward? Come brainstorm and share any and all ideas! Join us for a walking tour of Mountview Cemetery, and learn about the "History of Billings' Early Cemeteries" Meet in the Veterans area on Central. 12n departure. A History of Billings’ Early Cemeteries. Come join us as we do a walk-about on the Rims and learn about Yellowstone Kelly and the efforts to refurbish his grave site. Meet at the Yellowstone Kelly grave site. Carpooling encouraged. Ms. Petroff is a certified ONE Trainer, Speaker, Author and Coach. She is a transformational leader focused on employee empowerment and challenging the traditional leadership hypotheses. She coaches both personal and professional relationships while helping leaders find their ONE thing, implement rapid change and improve relationship engagement. Please attend and benefit from Emily’s presentation on personal and professional development. Enjoy a special wine tasting exclusively for MAFE at City Vineyard! Wednesday, September 20th starting at 5:30pm. $25 includes wine tasting and food. Additional beverages may be purchased separately. 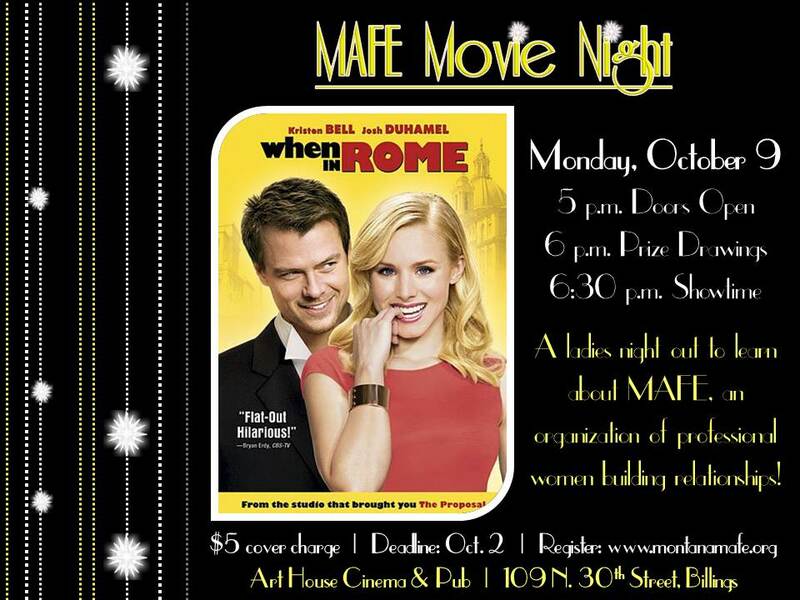 Space is limited, so please RSVP as soon as possible to mafe.rsvp@gmail.com. Lunch Meeting - Becky Bey, "Real Colors Personality Workshop"
Ever since Ancient Greece, people have recognized that individuals within a culture operate differently, with different personality styles. Almost since that time, there have been tests to try to help people figure out their own styles as well as how to work well with the styles of other people. The True Colors Personality Test is one such test where we will use four colors to represent four personality styles. Each of us has some of all the colors in our personality, but most of us have more of one than the others; our dominant personality style. Come join us and find out what color you are! 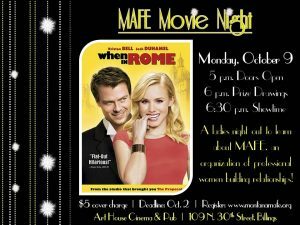 A ladies night out to learn about MAFE, Chance to win door prizes, Opportunity to purchase raffle tickets for amazing baskets, Get to know MAFE members... ALL that and a fun movie to watch too. Deadline to register is October 2nd. r, Rowe says, "I help clients identify and become curious about their limiting beliefs and negative thought patterns. Once we identify the core issues that are keeping them from their goals, we begin to create strategies to help them move toward a fuller, more joyful life!" Jill Hirschi, Director of Development & Underwriting at Yellowstone Public Radio will speak about the importance of public radio today especially in Montana and Wyoming. She will also discuss the many challenges that YPR faces in everything from funding to the geographic area that it covers and how they are working to face and overcome these challenges. Officer Keightley will speak to us about personal safety. Tasers, guns, walking at night, and many other issues we should all consider as we travel about in daily life. Questions encouraged! 6:00PM - June Luptak's house - 603 Beverly Hills Blvd. Game night with MAFE is always a great time! Bring an appetizer to share, and something to drink. NO MEETING - Enjoy the Holiday! SAVE THE DATE!!! This year's party will be at the Petroleum Club! More info coming soon. Come have some fun and learn a little about your fellow members!